Spring is certainly taking its own sweet time here in Chicago, the rain has been relentless, the cold positively autumnal. But my hostas are a poppin' and our Mama Robin is back in her nest for the sixth year in a row, so we know it is going to settle in eventually. And things here at the Chateau are really cranking along. Starting next week I'll be able to do the room-by-room design stuff, and I'm enormously excited about that! But today I want to talk about the future. One of the things that can be difficult about renovations is that your focus is so much on the present. What do we need right now, how can life be made better/easier/prettier today? We know what needs fixing in the immediate, but sometimes forget to think about what we might need down the road. How many people do you know who have spaces they renovated when their kids were small that now sit unused because the kids are out of the house? Or who have to completely redo projects that they completed not long ago because an aging family member comes to stay? We knew when we began this project that we were looking at the long haul. We fully intend to be in this house until it is time for us to depart this earth, and we hope that means a very long time indeed. As such, when we began to design the building we took that into consideration with the renovations. For example: There is only hardwood flooring throughout the house with no transition bumps or lips or changes in levels anywhere, and all hallways and doorways are wide enough to accommodate wheelchairs or walkers should the need ever arise either permanently or temporarily. Both our master bath shower and the shower in the basement are walk-in with no lip and large enough for equipment if needed. We put Charming Suitor's office on the same level as our master bedroom, and put in a closet and it's own small full bath with shower so that if we ever need to have someone come live-in to care for us, it can be converted to a bedroom conveniently located. While we put our main kitchen on the second floor, an unusual choice for many, we are keeping the first floor kitchen as a catering/prep kitchen. This means that if ever the house gets too big for us, we can choose to deconvert it back to two duplexed apartments if we want. In the kitchen, there are no upper cabinets. I'm 5'3" and not getting taller as I age, not to mention I'm a klutz, so since we were lucky enough to have the room to do everything undercounter, I know that as long as I can cook, I won't have to get up on a stepladder to reach my everyday dishes. Our hope, since we don't have kids and have several couples who are dear friends who also don't have kids, is that we essentially have built our own future retirement facility! Think Golden Girls but with couples. Nice retirement communities are wildly expensive, and a lot of what you pay for is good food and good socializing opportunities. We figure if we just move our besties in with us, we get all the socializing, and we know the food is great! We will pool our resources, hire whatever help we need, and as long as no one needs memory care, we can be a bunch of fabulous independent old folks up in here. Which brings me to the elevator. Yes. We are installing an elevator. In fact, we are installing an elevator right this very second as I am typing this. I know this sounds like the ultimate chi-chi fancy Warren Buffett sort of thing to do. But I am here to tell you that not only is an elevator sort of shockingly affordable, it is something that I think anyone in a multi-level home they adore should look into. I know so many people who have had to leave their family homes before they really wanted or needed to because they just could not handle stairs anymore. We are already middle-aged people with wonky ankles, bad knees, and backs that occasionally slip out of alignment. We have a house that is a total of four living levels, with 18 steps to get from level to level. That means when I'm in the basement to workout, it is 54 stairs to get to my bedroom. This is fine right now, but won't be in 20 years. And you had better believe I intend to be here in 20 years! When we were first designing the house I said we would need an elevator. And we would need the elevator to do a few unusual things. One, it would have to be able to open not only on each of the four floors, but also out the back in our parking pad at ground level. That means it would have to open on two contiguous sides, the front side and the left side. It would then also have to have some security features since one door is external to the building. And we would need it to be large enough to accommodate a wheelchair with a caregiver. Lucky for us, we had the perfect spot! When the house was three apartments, there were a series of small powder rooms in the very back corner of the building, all stacked up on each other in perfect alignment. 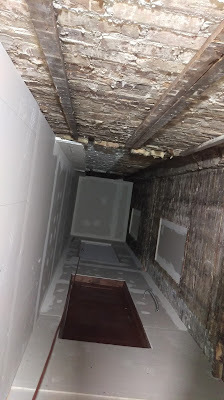 So we had a natural elevator shaft (or hoistway, as I have discovered the companies call them) just waiting for the interiors to be demoed and the floors to be removed to create 40 feet of elevator housing! This is looking up the shaft from the first floor to the roof, you can see the two doors and the blocked off windows! When we started looking into elevator companies, there were several local folks specializing in residential elevators. But only one could really do everything we wanted in our budget. That was Extended Home Living Services and their home elevator arm To The Top Home Elevators. From the first meeting they were great, giving us all of the information on how to get an elevator that would work best for our ongoing needs. They had all the best stuff, both hydraulic and winding drum mechanisms available, all sorts of options for the interior of the cab, and most importantly, they could do a residential elevator that would be able to do the full building and have the essential two-side opening feature! It has all sorts of extra features like accordion style gates that open and close automatically, the ability to turn it off completely when we go out of town, and an external access security system that uses a punch code to call the elevator, which means that when my family comes to visit and they park behind the house, they can just punch in the code and come right on in! We got to pick interior finishes, which I will share later, but you can go as simple or fancy as you like. We went with winding drum instead of hydraulic since it is a bit easier to maintain. And when I tell you that we were truly blown away by how affordable this thing is, let me just say that it is less than half of what it is going to cost us to redo the stairs. Yeah. this is our elevator being delivered!!!! My contractors were able to prep the hoistway on their own and said it was pretty straightforward with the input EHLS gave them. But if you don't have a convenient spot already in your house like we did, you can actually build an elevator shaft on the outside of your home in a good location and then just open doorways to get internal access. Who knew? Lucky for us, at the moment, we don't need any of their other services like stair lifts or ramps or stuff, but they do it all for accessible living. And while affordable elevators doesn't mean cheap elevators, if the only thing preventing you from getting another 10-15 years out of loving your house is a flight or two of stairs, they start to look practically cheap. If you have a parent who really doesn't want to leave the family home, and is still able to be independent but for your concern about stairs, I cannot recommend strongly enough that you at least call someone to come take a look and see what is possible. By the time you add up the cost of fixing a home up for sale, finding a new one, paying for moving expenses etc., you might find the cost is a wash! Stay tuned, there will be more elevator updates as it gets installed.